When the three turbine Blaen Bowi wind farm was erected in 2002, turbine three was just 350 metres from one side of our land and just 750 metres from the house, little did we know that wind turbine generators could be so noisy but then, we had no reason not to believe the statements made by those involved or our elected representatives, both have proved to have their own reasons for continuing to ignore the issues especially the suffering of noise disturbance by many local residents who live, too close to the many wind farms erected across the UK and indeed, the world. There has subsequently been an application for three more turbines at the site which has resulted in a recent Public Inquiry and we await that decision and I will come to this further on. When the Blaen Bowi wind farm went into operation in the summer of 2002, we and others were shocked by the noise issues, this statement will include reference to others, we contacted the wind farm operators and the Project Director who stated that no real noise issues will arise, occasional gentle swishing from the turbine blades, how different the reality compared to the statements and impressions given in the environment statement but as we subsequently found out, the environment statement and indeed predicted noise levels from computer based noise monitoring, are not independent statements/reports, and that is allowed within both the government and planning guidelines. We complained about what we called a whining noise which basically was ignored by the wind farm operators, they promised a full investigation but nothing happened and we were not aware at that time of that there was a department at the council to whom we were able to complain, the department of the environment and public protection. The letters from the wind farm operators, including to the press basically said what came to be the usual response that everything conforms to the guidelines, the ETSU-R-97, which as it transpires, are the official guidelines which many experts across the world consider not to be adequate and indeed, flawed. It appears that it suits the government to retain these guidelines even though there are significant complaints of noise suffering from wind turbines and not just across the UK, to have a fair and honest noise monitoring set of guidelines would no doubt have an adverse affect on the government targets, however, in my opinion, local residents and people, should be given the priority. When the wind farm operators submitted an application in 2005 to extend the wind farm by a further three turbines, most local people were shocked and suddenly, we realised we were not the only residents complaining of noise disturbance and also were advised that we could complain to the council department, an action group was formed and we started to research our various issues and were quite surprised that so many existing complaints of a similar nature had been made across the UK. Subsequently, complaints were received by the department of the environment and public protection and investigations commenced, it transpired that the predicted noise assessments for our property within the original environment statement were actually taken from noise monitoring at another property that was very different!! The council insisted on noise monitoring to assess the complaints at only two properties however, the official noise consultant arrived in October 2005, over three years after our complaints of whining noise started, he said, “that whining noise is tonality, they should not make that noise, it can be easily fixed” unfortunately, that has not turned out to be the case. In addition, the above statement was omitted from the subsequent noise report, a vital statement to say the least. At the Public Inquiry the official noise consultant stated that the new turbines will be quieter and less noisy, however when asked if he could prove that statement, he said, No. We were right in our complaints but did not receive an apology from the operators but even more surprising, our elected representatives still continued to support the wind farm application. We wrote to Nordex the manufacturers and were told that they would carry out a full investigation, they had not previously been made aware of the problems but would report back to us when the investigations were complete, despite many letters, they never have. Prior to the planning committee meeting in September 2007 a noise report was submitted and indicated that everything was within the guidelines even though it was then clear that the turbines had faults, during the monitoring period the turbines were either stopped or on go-slow for 26 of the 32 day monitoring period, the planning department accepted the report and removed noise as a reason for recommending refusal, fortunately, the majority of the planning committee listened to our personal statements and voted to refuse the application. The majority of local people were delighted with the decision which is why one of the general issues of concern is that as individuals, if the decision of the planning committee was against our case and position, then we must and indeed would, accept that democratic decision, it therefore upsets local people that the same rules and indeed acceptance of a democratic decision does not apply to the applicants. Most local people were not against the original wind farm however, what they say now is, “If only we knew then what we know now” and now, the majority of local people are dead set against and say, surely, they will not be allowed more turbines. We are all in favour of renewable energy but there must be better ways that do not result in local residents having to suffer. It is clear that you could cover the whole of Britain with turbines and it will not stop one nuclear power plant and make minimal difference to the global warming problem. I fully support farmers and land owners who diversify and in fact applaud them but, it should not result in neighbours having to suffer the consequences. I believe that the noise disturbance and nuisance is against basic human rights and within the human rights act for example is article 8 – Right to respect for private and family life which includes the right of a neighbour to be protected from noise nuisance. The council department for public protection should be able to protect residents but it has transpired that they are basically powerless because the ETSU-R-97 guidelines protect the wind farm operators to no doubt ensure that the maximum number of turbines are erected across the UK. There were many reasons for objecting to the application to extend the Blaen Bowi wind farm, the official action group objection letter covered more fully and the following is essentially the abbreviated version I included in my statement to the Public Inquiry. How an application to extend can be considered when there are so many outstanding complaints has always astonished me. I did not go into detail but people should realise the facts of living with a wind farm and not the myths as wind farm developers and the association put out, why cannot everyone be honest and admit that there are problems and issues is, I consider a very sad state of affairs. I am no longer at my property close to the wind farm however, my family is and because it is across the valley, turbine 3 towers above you like a gigantic white monster, and they want to make that three, horrendous, the developers appear not to care about the adverse affect on local residents. It happens and not only within 600 metres as stated in the various environment statements, it is shown to happen at 750 metres plus. A fact, why should local residents lose out on the value of their family home? Some former members of the action group sold up to get away and all sold for what was less than the market rate at the time of sale. Great concern has always been as to how close turbine three is to the very busy B4333, over 3,000 vehicles per day, there have been incidents of broken blades in both the UK and across the world, the applicant wants two more turbines just as close – heaven forbid if an incident occurs here-absolutely frightening. The environment statement refers to the B4333 as a quiet road!! 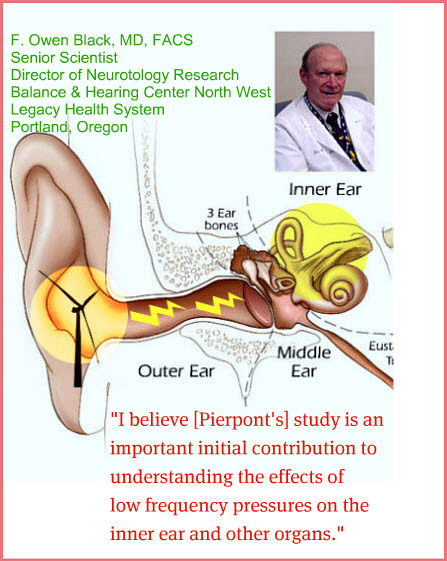 Many experts state that the noise monitoring guidelines, the ETSU-R-97 guidelines are not adequate, Professor Van Den Berg, eminent scientist and expert on wind farm issues says that the methods used to predict noise from turbines are flawed. For those local residents who suffer noise disturbance, the actual noise problems caused by the Blaen Bowi wind farm varies depending on your location to the wind farm, across the valley, down the valley, either side of the hill, however, the result is the same, suffering with noise from the turbines, a fact, not a myth. Local residents do not make it up, there is no fun having to complain year after year. “In 2002, our idyll was shattered, with an event that would impact our lives ever since…. The Blaen Bowi Wind Farm went into service!!!!!!!!!! I will repeat the statement, local residents do not make it up, there is no fun having to complain year after year. The tonal noise has been the worst from my experience, this is a constant, whining/grinding noise which I suffered with for over six years, you are prevented many times from enjoying your own garden and property. It is not just the noise level but the fact that it is constant mechanical grinding noise, 20x a minute, 60 minutes an hour, hour after hour, and that is just one turbine!! Unfortunately, the noise monitoring does not record the constant affect. The environment statement gave the impression that the turbines would not emit tonal noise, inaccurate statement. The UK Noise Association report in 2007 includes case studies from Blaen Bowi and gives examples of local residents who have and are suffering both noise and health issues but the council allow the planning application to extend the wind farm to continue almost oblivious to the problems. The wind farm shown on the front cover of the report is Blaen Bowi!! Professor Van Den Berg, eminent scientist and expert on wind farm issues, sent a letter to the Sustainable Development Commission in which he quotes an example of one of my neighbours down the valley and the problems they have with noise disturbance from the wind farm, he visited the property himself so he knows of the issues first hand but the application to extend is still allowed to continue within the planning process. So beyond the UK, they are aware of the problems caused by the Blaen Bowi wind farm but within Carmarthenshire, the application to extend and erect more turbines is allowed to continue!! Professor Van Den Berg has also stated there are additional noise problems when you have a valley situation with noise being thrown away from the turbine blade tips and across and down the valley, you also get an echo effect, this is precisely the location issue for some of the residents local to the wind farm. Professor Van Den Berg again, “There should always be a procedure to determine noise exposure independently of the noise producer”. When are our elected representatives, planning authorities, members of parliament and those in position of influence, actually going to be prepared and stand up for individuals who are continuing to suffer from wind turbines? I suffered with tonal noise disturbance and nuisance from the Blaen Bowi wind farm for over six years. Environment statements should be done by independent consultants. Original noise monitoring should be done by independent noise consultants. Noise impact assessments should include tonal noise. Elected representatives should fully investigate residents/constituents complaints even though they support a planning application, they should not ignore the complaints. Procedures that must be followed by officers following a noise complaint make the action too slow. There should be a rapid response unit/procedure to avoid significant change of conditions by the time someone comes along and puts a microphone on your lawn. Noise monitoring following complaints should be independent of the wind farm operators and carried out by independent noise consultants. Noise monitoring should record the constant continuing affect of tonal noise, not just the noise level. Where it is clear there is noise disturbance and the guidelines / ETSU-R-97 state that all is okay, there should be a procedure to alert the national policy committee in order that change can be implemented asap. An application to extend an existing wind farm should not be allowed to progress whilst there are a significant number of outstanding complaints that have not been fully investigated and resolved where necessary.